Recipes, Crafting, Photography, Babbling and more! 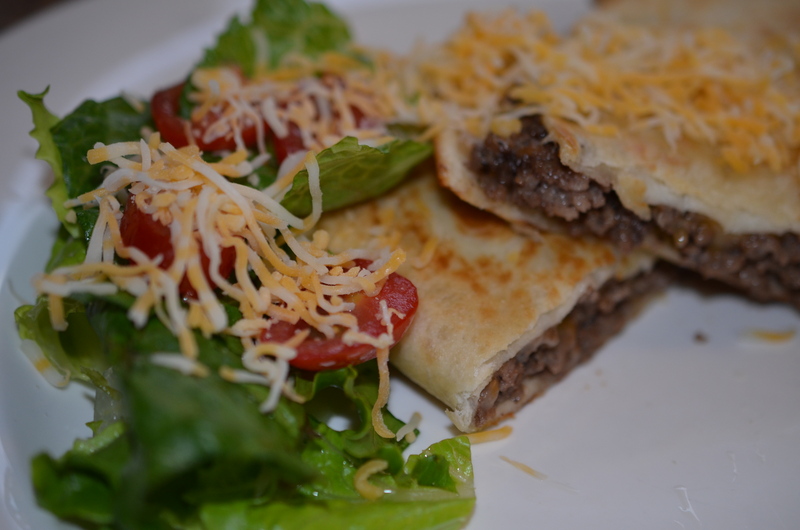 There was a restaurant I loved meeting a girlfriend for lunch when I lived in Maryland, and they made the BEST cheeseburger quesadilla!! It was a whole burger in the quesadilla shell, and try as I might, I could never make mine even CLOSE to tasting or even looking like the restaurants version! I browned one pound of ground beef along with a diced, small onion, salt and peppered to taste. I then drained any grease and added 1 teaspoon of Worcestershire sauce and a beef bouillon cube. On a medium low heat, I tossed a flour tortilla shell in a fry pan with a little oil, and very lightly heated and toasted one side. 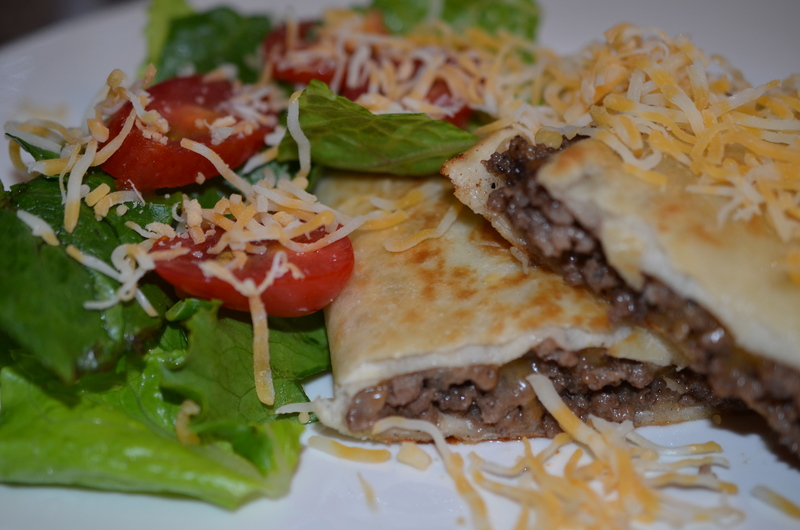 I quickly added to half of the shell, a scoop of the hamburger, added shredded cheese (I almost always have shredded colby jack and cheddar in my fridge), a little mustard and flipped the other side over the hamburger mixture. After just a few moments I removed the quesadilla form the pan and transferred it to a serving plate. Using a pizza cutter I sliced it into 3 triangles and topped with a little more shredded cheese, shredded lettuce and tomato. You can also add sliced onion along with the lettuce and tomato. 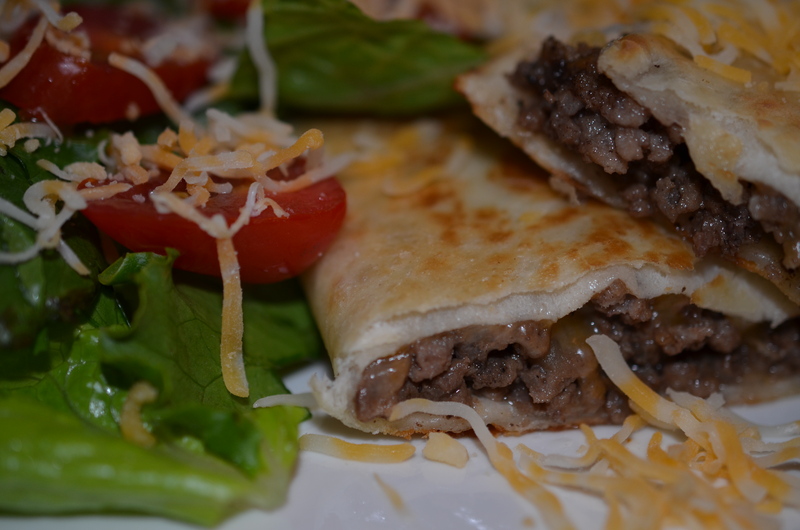 And you can add mushrooms, ketchup… customize the quesadilla to your craving! Brown the ground beef, drain and add the Worcestershire sauce and bouillon cube, stir until dissolved. Grill or fry one side of a tortilla, add a scoop of burger to one side, add cheese, mustard, ketchup or mayo and fold over the other side. When heated through, careful not to burn, transfer to plate, slice and top with your favorite toppings. Be sure to follow me on Facebook so you get all the last minutes posts, babbling and rambling!